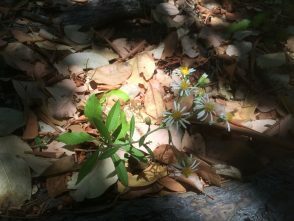 Fall-blooming asters provide color and habitat at a time of year when there are less flowers blooming and many plants have already started going dormant after a long, hot summer. 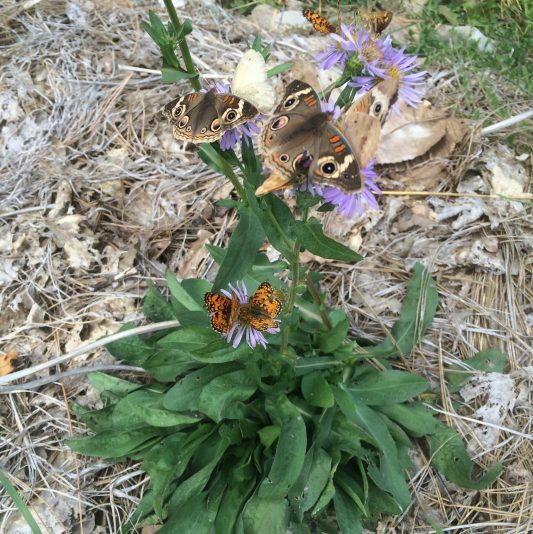 The pollen and nectar asters provide to pollinators during the fall is crucial. 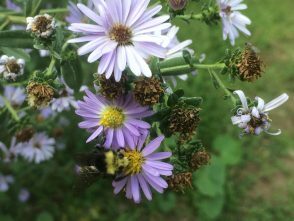 The available forage for pollinators in the fall is diminished compared to the full bloom of summer, making asters key components of wildland plant communities, habitat restoration projects, and pollinator gardens. Asters are generally easy to grow from seed in containers for grow-out and outplanting. Aster seed can also be added to seed mixes for direct seeding. The growing conditions for asters vary by species. 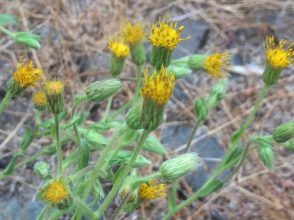 Asters that generally grow at lower elevations, such as roughleaf aster (Eurybia radulina) and Oregon goldenaster (Heterotheca oregona), bloom late in the season in very dry, often rocky soils, and will prefer dry sites with little to no irrigation. Whereas, asters that grow at low-elevations in moist conditions, often along streams and rivers or in wetlands, such as Douglas aster (Symphyotrichum subspicatum), Pacific aster (Symphyotrichum chilense), or Eaton’s aster (Symphyotrichum bracteolatum) will need to be grown in a moist or irrigated location. Asters that generally grow at higher elevations also grow in various habitat types. 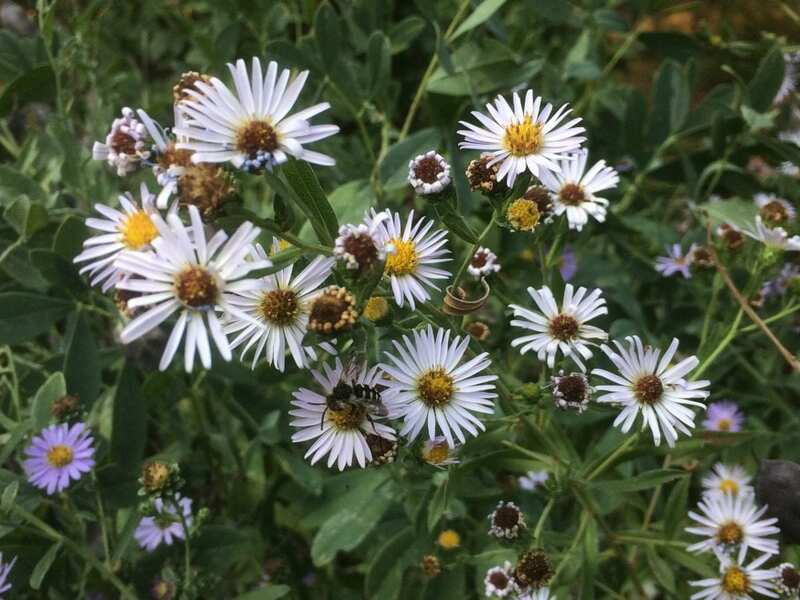 Many higher elevations aster species, such as leafybract aster (Symphyotrichum foliaceum), grow in moist meadows and along streams and in wetlands in the mountains. 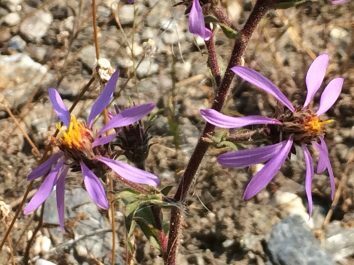 There are also asters that grow on high elevation rocky ridgelines or on dry slopes or sunny openings in forest or chaparral, such as thickstem aster (Eurybia integrifolia), Brewer’s aster (Eucephalus breweri), or Siskiyou aster (Eucephalus glabratus). 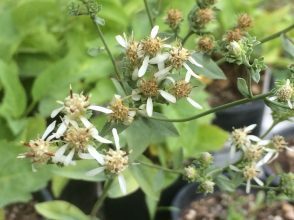 Some species will grow at varying elevations and habitat types, such as Oregon whitetop aster (Sericocarpus oregonensis) that is found in mesic to moist habitats, well-drianed open woodland, as well as open or rocky mixed conifer forest. 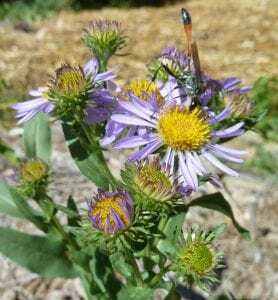 Asters are a key component of native seeding or planting projects. 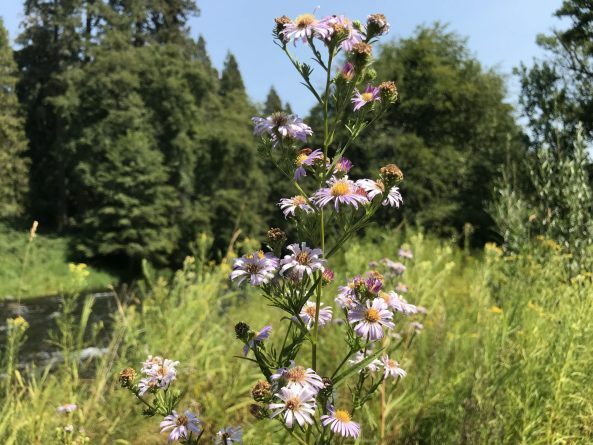 It is good to strive for a variety of bloom times when planning planting or habitat restoration projects, and asters help fill in the late-season bloom. 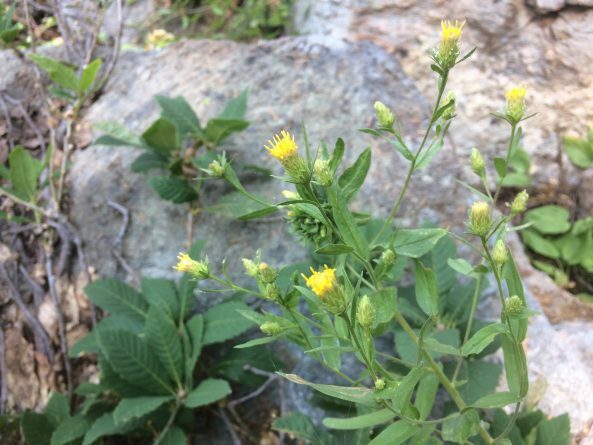 Next to rubber rabbitbrush (Ericameria nauseosa), asters are some of the most crucial late-season pollen and nectar sources for southbound migrating monarch butterflies and other non-migratory pollinators that are fattening up before winter. 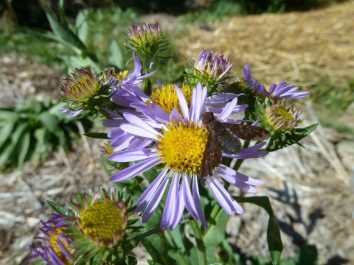 Enjoy fall-blooming asters for beauty and habitat!